Occasionally, from time to time, the people who control the World Feed (Formula One Management), are criticised, for a variety of reasons. This can vary from missing that crucial race winning moment or just simply providing a stale output. By ‘stale’ I mean sticking to the same old approach race after race, such as the usual start replays which tend to appear on lap 3, typically just after DRS is activated! Camera angles is another one. Compared to the Formula 1 of past, the majority of camera angles nowadays are designed to fit in as many adverts as humanely possibly. Sometimes, I do feel that the speed, and the sense of direction is not captured as well as it could have, due to camera angles being placed specifically to fit commercial and advertising needs. This has led to virtual advertising. For the most part, this is fine. However, on occasion, it can lead to it being too obvious. The image above is from Silverstone at Luffields. My motto tends to be that, where possible, the car should be the focus of the shot. Whether it is car racing towards you, or a change of direction as I alluded to at the start. For me, I don’t think that either of the two apply in the image above. The Fly Emirates advertising dominates the image and is in fact a complete distraction away from what my eyes are meant to be looking at. Deliberate? Possibly. I’m not a particular fan of these. The virtual advertisements that are subtle are the best. Yes, it means that I still spot them, but at the same point they end up not being a dominating part of the image as is the case above. For all the criticism though, I do feel that FOM have made some significant strides forward this season where innovation is concerned. The first main one for me is helmet cam. First seen back at the 2008 Brazilian Grand Prix on David Coulthard’s car (albeit for only two corners), the innovation has been seen significantly more this season in Valtteri Bottas’ car. As always, it is a joy to have the helmet cam to see just how much work goes on behind the wheel of a Formula 1 car, and is probably one of the more important strides forward, I feel. Furthermore, the helmet cam has made its way down to GP3 with the camera being attached to Daniil Kvyat’s helmet, which I think is important as it gives the series more of an importance if innovations are being used further ‘down the chain’. …but for every criticism, there is a positive, this being one of them from Monza. The recent pit lane changes by FIA as a result of the bouncing tyre at the Nurburgring meant that FOM cameramen were restricted to the pit lane wall during Qualifying and the Race. Instead of just keeping it at that, FOM decided to attach cameras to team personnel and the traffic lights pole, in one case. 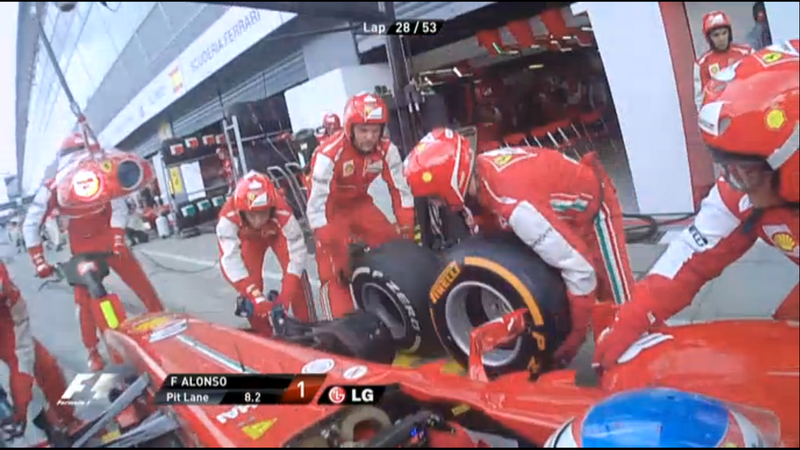 This resulted in some fantastic images being beamed around the world from the Monza pit lane as viewers got up close and personal with the pit crews as they were fast and frantic at work. The two examples last weekend with Red Bull and Ferrari, so I hope that continues for the remainder of the season. The last innovation worth a mention has to be Paul di Resta’s thermal imaging tyre camera, which was frankly fantastic last weekend. I hope that the thermal imaging looking at the tyres doesn’t turn out to be a one hit wonder, and again I hope we do see it again before the end of the year. The only thing I think that needs to be added down the line is maybe some sort of temperature gauge to show how hot the orange colours really are, for example. In the past, there have been many innovations that have been thrown to the dustbin, and I hope that doesn’t happen here. It has been a good patch though for FOM where innovations are concerned and I think that needs to be noted. Yes, there are bits which need to improve, but overall it has been a job well done by the whole production team recently. Now all we need is for their social media team (if they have one?) to get their act today, then we will all be happy bunnies. All images, copyright Formula One Management, 2013. I am normally so into the racing I can’t say I have even noticed the adverts. They should speak to Greenpeace about how to do it right. 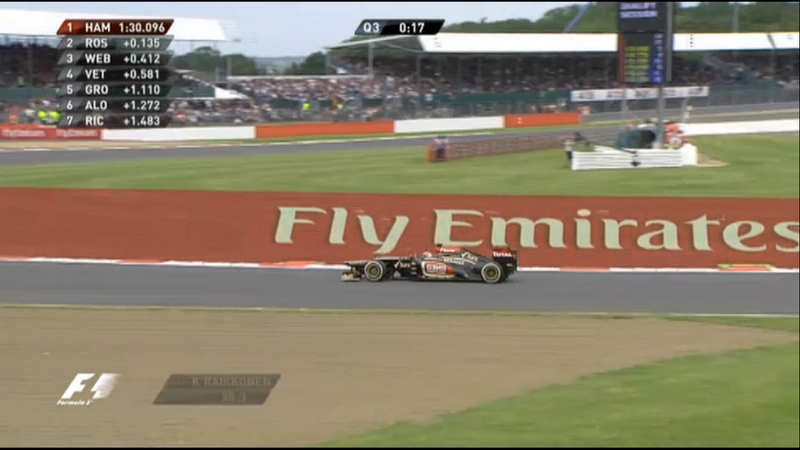 I don’t think FOM are too bad when it comes to the visibility of the adverts. In fact, if I remember correctly, Bernie Ecclestone even forbids any on-car or on-helmet sponsors’ logos to be facing the onboard cameras – a problem that pervades other (particularly US) racing series. Télé Monte Carlo, however, are terrible offenders. It seems like every single camera angle around the Monaco circuit is specifically designed to make the advertising banners as visible as possible. The angle from Portier is particularly bad. As a car goes past it seems to zoom in on a banner that hangs above the entrance to the tunnel. Once I started noticing it, I couldn’t stop and it drove me nuts. FOM have done tremendous work to continually improve the television images and camera angles over the years. The most photogenic circuit has to be the Yas Marina in Abu Dhabi. Can anything be done about the on screen graphics? They show driver positions, speed, etc., but interrupt and invade the composition of the overall TV image. It’s easily solved with a letterbox format aspect ratio to the TV screen with the graphics presented above and below outside the frame. After the sky tv deal was announced i have taken my anger out on the sponsor. they should be hiding there logos from me not putting where i can see them. a week after the sky tv my santander bank account was closed. 2 months later Vodafone contract canceled etc. even when itv had f1 contract i use boycott texaco petrol station as they sponsored the adverts at that time. I stiil rarely go there as it is the local petrol station out of habit. Total petrol station have now joined the boycotted list as they sponsor red bull. We need a new tv at home currently. It wont be LG make as they sponsor f1. Some years ago when A1 racing started I thought great, we now have an option to stop feeding profits to Bernie. What a pity it did not last. A crowd of us used to drive down to Durban each year to watch the South African leg. It was almost as good as watching F1 and I assumed it would get better as they got more experience. What a pity it did not take off.